This set of cord tags comes in 4 colors, lime green, pink, blue and orange. 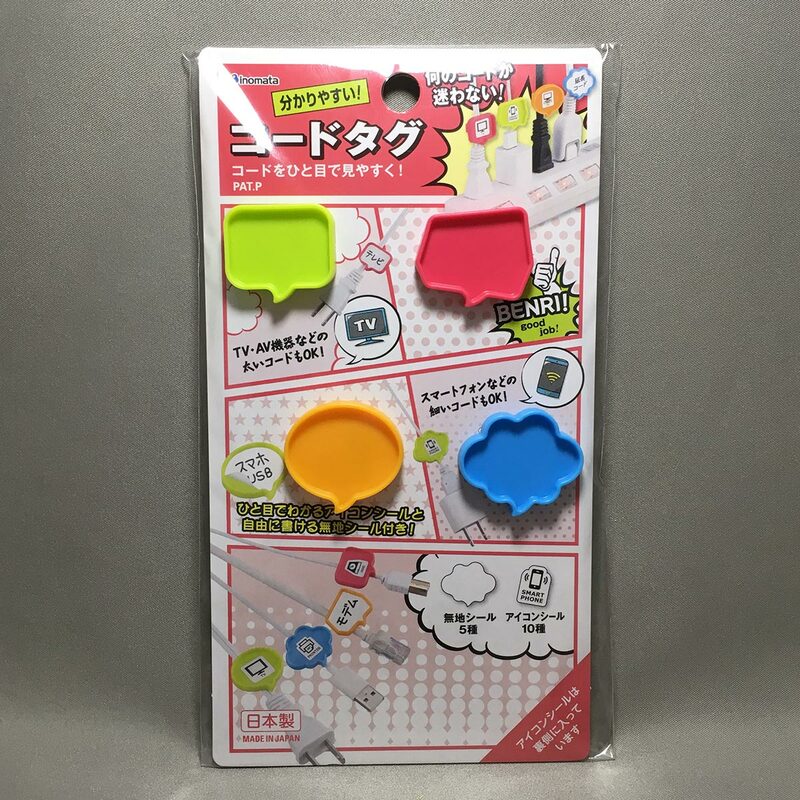 Each speech bubble tag is shaped differently. 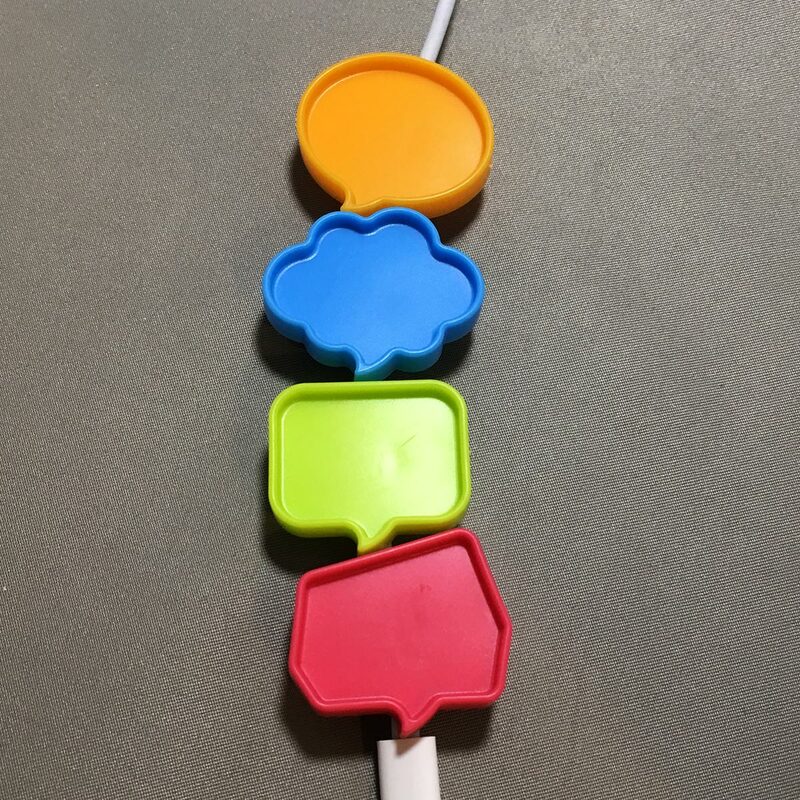 Included with the cord tags are stickers that can be used as labels. 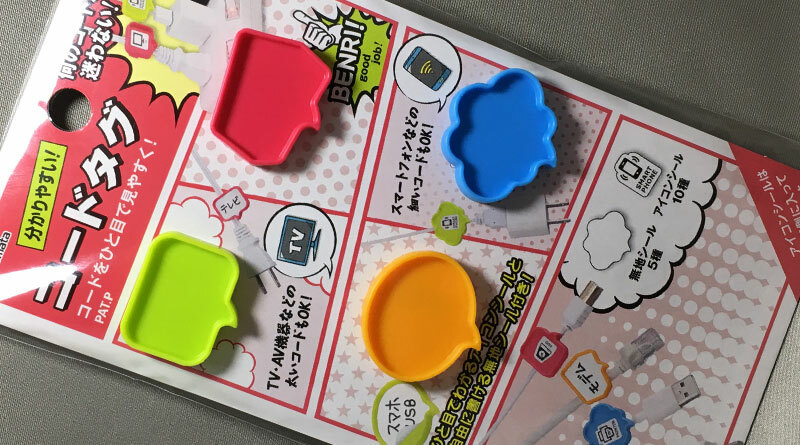 There are 2 types of stickers, blank labels and printed icon labels. 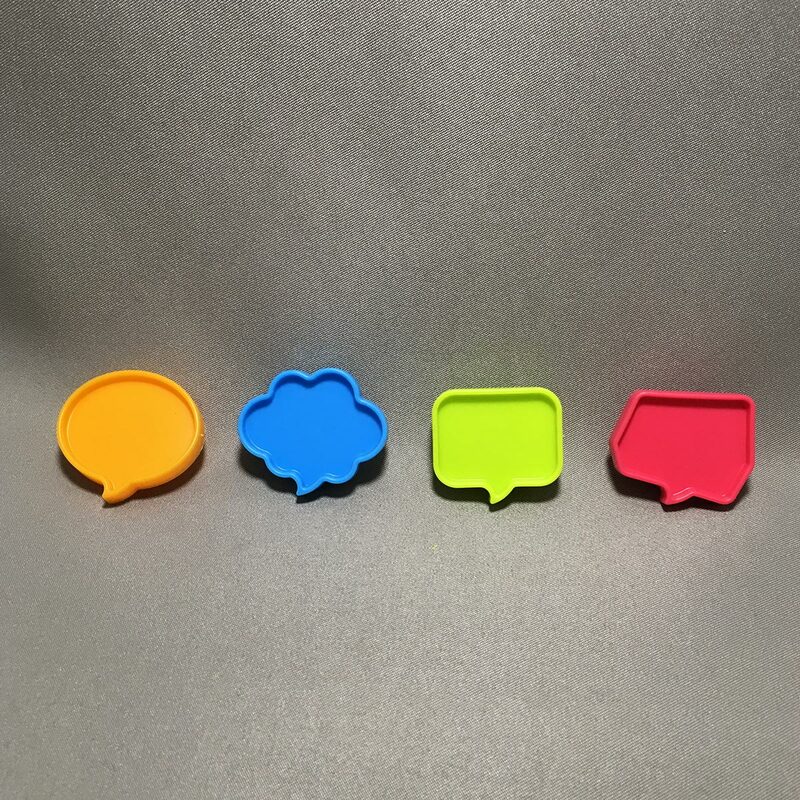 A set of 5 blank labels are shaped as the speech bubbles and a set of 2 blank square labels. 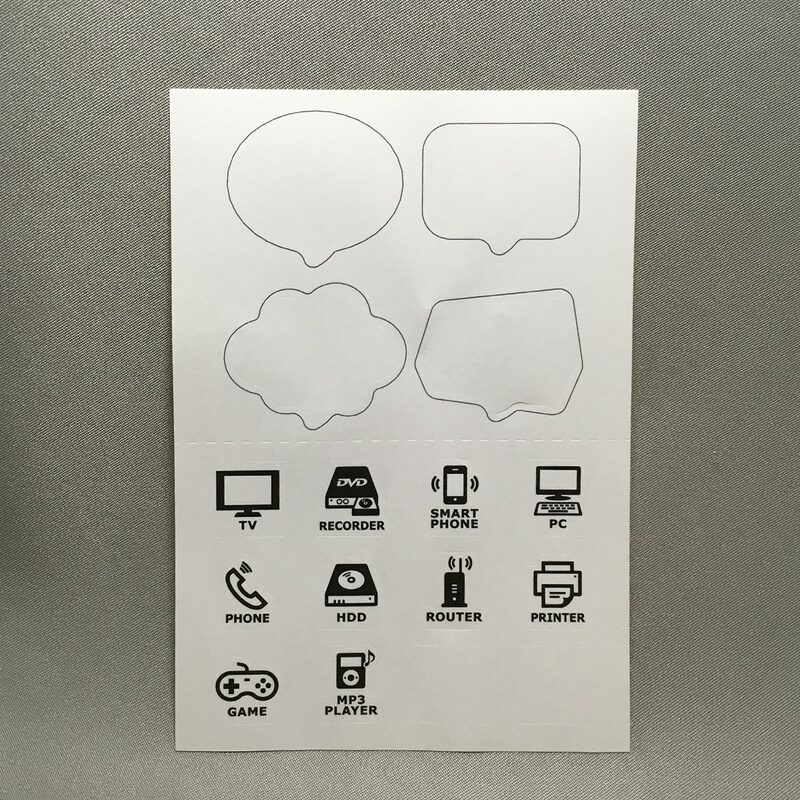 There are 10 printed icon labels for appliances/devices such as TV, recorder, smartphone, PC, phone, HDD, router, printer, game and mp3 player. 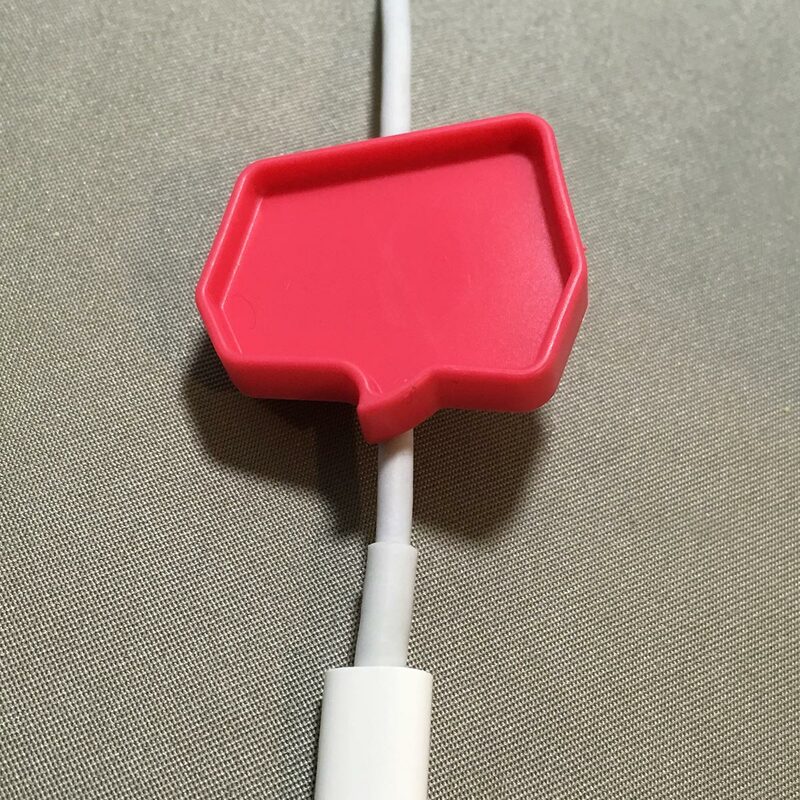 Attach the clip on the back of the tag to the cable. 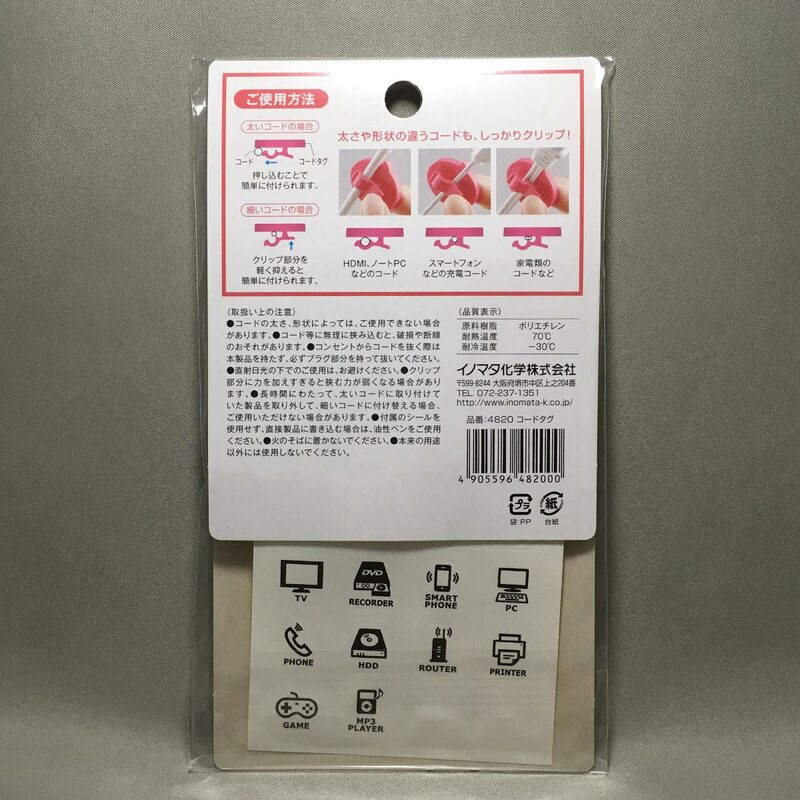 There are three positions to clip the tag to the cord. 1. For thick cables (i.e. HDMI, laptop cables), clip to the larger first notch of the tag clip. 2. 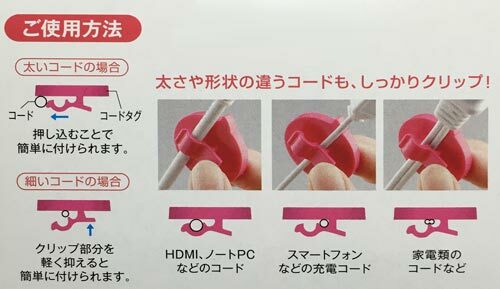 For thin cables (i.e. 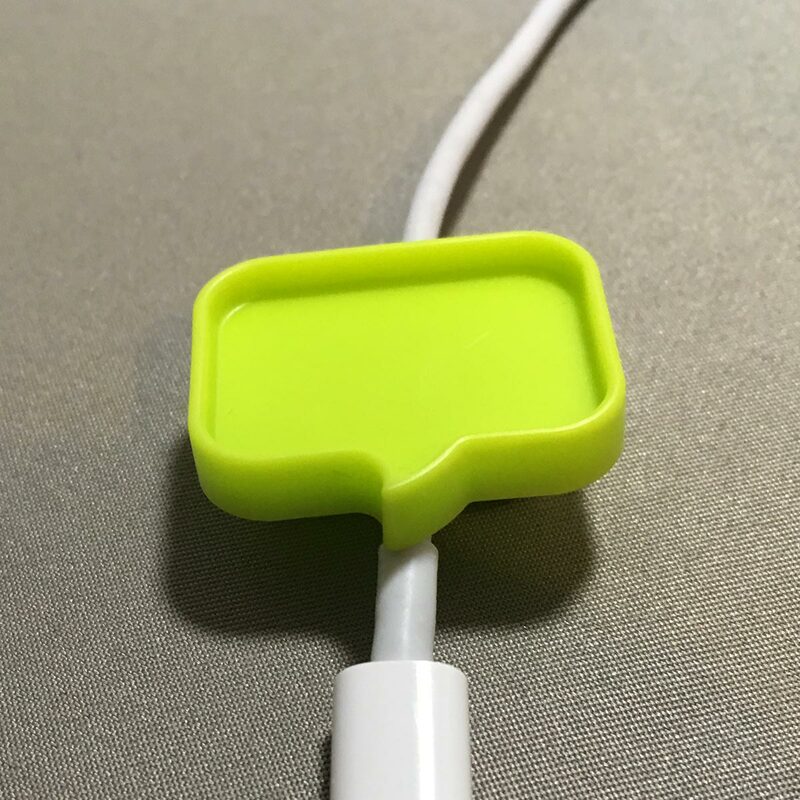 mobile charging cables), use the smaller second notch. 3. For parallel cables (i.e. 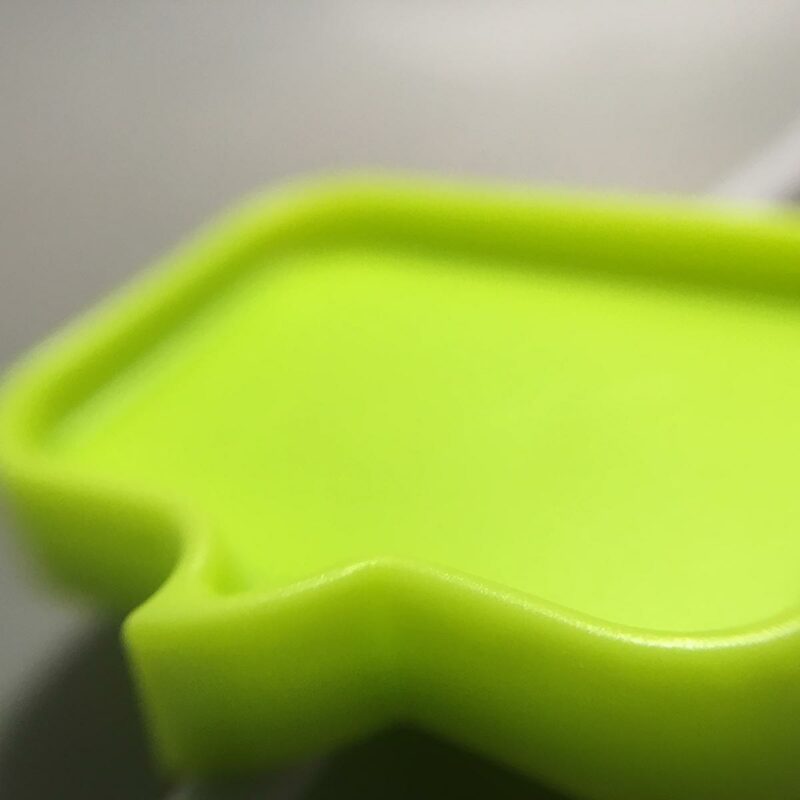 home appliance cables), clip the tag into the groove. – The cord tags may not fit due to cable thickness or shape. – Forcing the cord tag clip onto cable may damage the cable. – Do not disconnect the power plug by pulling on the cord tag. Disconnect by pulling on the plug. – Do not use under direct sunlight. 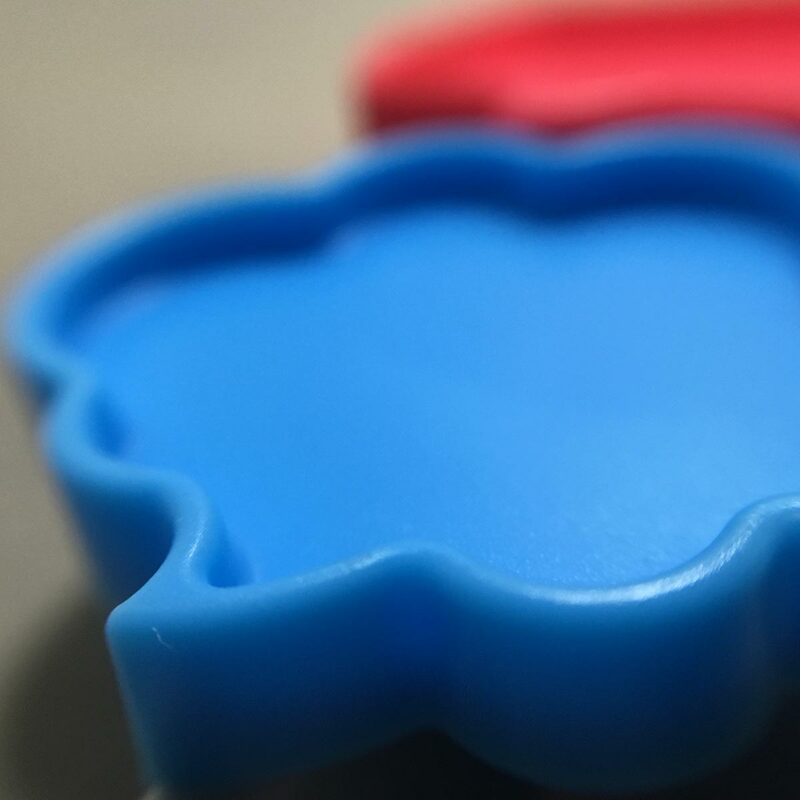 – Pressing too hard on the clip may weaken the clip. – Cord tag may not attach to thin cord if cord tag was previously attached to a thick cord for a long period of time. – Use oil-based ink to write directly on the cord tags is the labels are not used. – Do not use or store near fire. 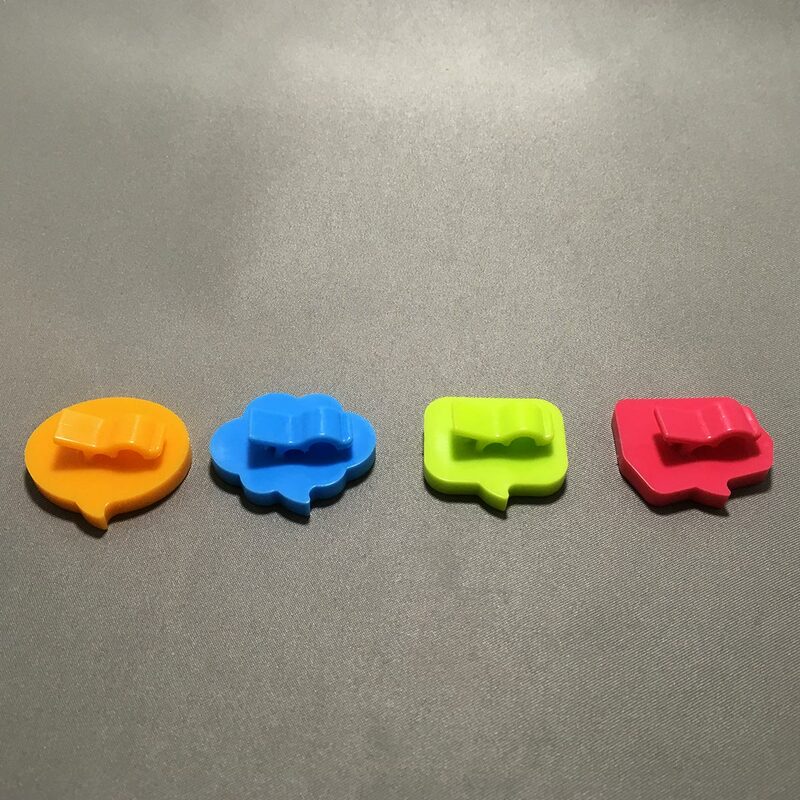 These are some colorful and fancy cable tags for easy labeling. If you’re like me, and you have a lot of extension plugs and cables, sometimes it isn’t easy to find which plug is attached to which appliance. With these tags, you label the cable before plugging it into the power socket, and now you know which plug is for what. I do like the shapes and colors, it really does add a nice touch to what can be a boring label. I also like the clip that has two different sized notches for different thickness of cables. This is indeed a cool product.